If you require a new boiler for your home or business property we are the specialists who can ensure that your new boiler is installed safely, speedily and with the minimum of disruption. As part of the professional service we provide we will advise you on the selection process ensuring that you get the right boiler for your property size and budget. You can be confident that we have the expertise to fit your new appliance safely so call us today to talk to a friendly Nottingham plumber and ask for a free estimate. Condensing boilers are proving very popular as they are more energy efficient than some older designs. Fitting a condensing boiler could mean that your home or business is heated more efficiently, saving on your heating bills. 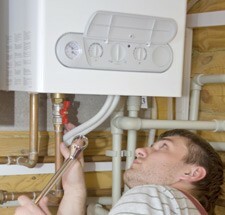 Contact us on 0115 815 7281 to see how we can help with your new boiler installation.